Farm Dog is a digital platform that uses local field data, analysis and insights in real-time to help growers and agronomists track, anticipate, prevent and respond to pest and disease pressure. Farm Dog was selected as a top technology for agronomists in 2018 by the National Association of Independent Crop Consultants. 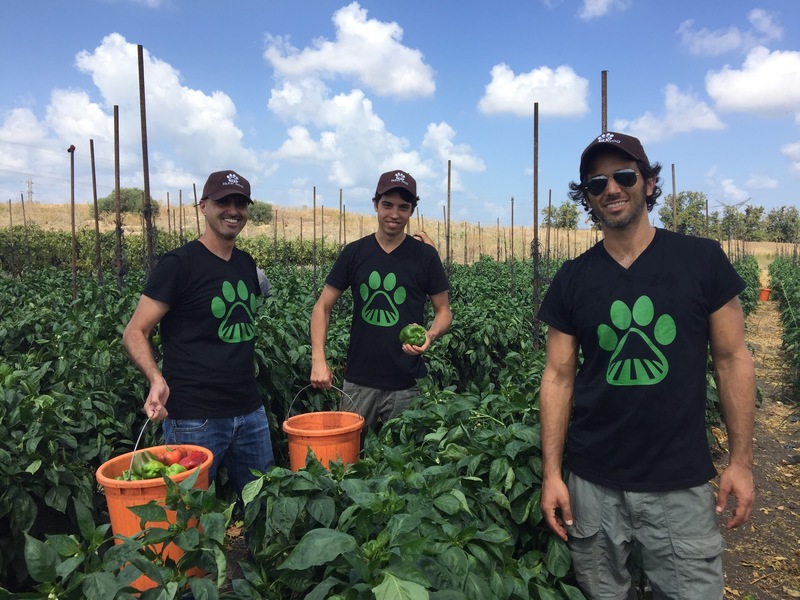 We spoke with Co-Founder and CEO Liron Brish to learn why he thinks Farm Dog is a farmer’s best digital friend. You have degrees in finance and law – How did you get interested in AgTech? I was born in Israel and grew up in Austin (I am a proud ‘Tex-raeli’ ), and although I didn’t grow up on a farm, Farm Dog has allowed me to come back to my roots. On my dad’s side, my grandfather’s family owned farmland in Ukraine before World War II, and he met my grandmother while working at a corn processing plant. On my mom’s side, my grandparents ran a butcher shop. After what I like to call my ‘expensive three-year vacation’ studying law at NYU, I started working for the consulting firm McKinsey. This was after the 2008 financial crisis hit, and I was assigned to post-merger risk management for some of the largest banks in the world. I realized I wanted to do something more exciting and was fortunate to get moved to consult on touch screen technology. It was around the time that the IPad first came out, and I began to realize the incredible potential for mobile across multiple industries. From there, I moved to the McKinsey Israel office, where I got my first true exposure to the ag and food system. I consulted on food waste issues in the produce supply chain – everything from how vegetables get stacked to talking to growers about product quality. During that time, I became a partner in a farm-to-fork restaurant in Austin that sources produce within a 50-mile radius of the city. I went on to learn about local grower challenges. After McKinsey, I founded a drone startup, which didn’t work out as planned. Did the failure of your drone startup lead to Farm Dog? Yes, it was through the drone startup failure that I met my Farm Dog co-founder Michael Hermon. Michael did satellite imaging in the Israeli Army, where he got interested in the application of drones to agriculture. He reached out to me about drones in agriculture. We met a number of times and realized we had a lot of common interests. From there we decided to explore the idea of co-founding an agtech firm. In the spring of 2015, we drove around both Israel and California asking farmers what they needed and how tech could help them. There was a severe drought in both places, and so the most common request we got was to help with water management. So, initially, we founded Farm Dog and raised our first round of funding to finance a soil moisture management platform. We put a sensor together using off-the-shelf components and built an app that allowed for data filtering and whole field view. We soon realized that we could better help growers not by being another soil moisture sensor company, but by focusing our talents elsewhere. So, we stopped all of our pilot projects, stepped back, and asked our partner growers and agronomists for advice. That’s how we ended up with Farm Dog as we know it today – a software platform for pest and disease management. What did you learn from having to make this pivot? The lesson we learned was that we needed a Day One value proposition for farmers that aligned with their ongoing activities. We had problems getting customers because we couldn’t provide the immediate value that the grower needed. Growers didn’t want to be guinea pigs for our product, and the adoption curve – particularly for hardware – is slow. So just how did Farm Dog pivot to integrated pest management? We saw that farmers scouted for pests and disease using old-fashioned pen and paper. So we decided to build a bottom-up way to easily record and use the data farmers were finding. The app we built was also a top-down solution to lower costs – by reducing crop loss, pesticide use, and environmental damage. We developed the platform in Florida, which has lots of specialty crops and a subtropical climate conducive to intensive insect, disease, and nematode management challenges. We basically cold-called people and drove over 1776 miles throughout the state to get a critical mass of users. Thankfully the doors opened for us. This is how we met Dr. Charles Mellinger of Glades Crop Care, who serves on our Advisory Board. We launched the new platform in Feb 2017. This time we made sure that we had a Day One value proposition – a product that was easy to use and that was as elegant as an iPhone or NetFlix. Your platform integrates with the John Deere Operations Center. How/when did you connect with John Deere? Deere found out about our work in Florida and reached out to us to integrate our app into their platform. They had heard a lot of good feedback from growers about our data integration abilities. They wanted us to start using their field data in our app, which helps farmers avoid having to input the data themselves. Last year Farm Dog and John Deere received a grant from the Israel Binational Industrial Research and Development (BIRD) Foundation. The grant is for a combined total of $900 thousand to jointly develop variable-rate spray control technology. 2017 was also the year you were accepted into the THRIVE Accelerator – what motivated you to apply to THRIVE? In 2015, we participated in the AgSharks pitch competition in San Diego and got to know the Western Growers folks there. We realized we needed to be an integral part of the California agtech ecosystem and that we would need to eventually locate in the state. So, we applied and became part of the 2017 cohort. We applied because we are strong believers in the ecosystem aspect of agtech. We have been very open from the beginning and reach out to all stakeholders, and are very proud to be able to work with Western Growers, USDA, extension agents across the country, and Deere. You can’t succeed if you sit in your little silo. What was the most helpful aspect of being in THRIVE? THRIVE did a great job creating an entrepreneurial ecosystem. We built strong relationships with the other companies in our cohort and still speak with the founders. The comradery was great. We were able to receive lots of feedback from many different players in the industry – from tech companies to financial institutions. THRIVE helped us get a balanced picture of where we can go with Farm Dog and how the company fits into the overall ag space. And THRIVE continues to work with us – for example, in 2018, we participated in a grower feedback session where we presented to 25 growers from the Central Valley. In 2017, our cohort was at too early a stage to officially collaborate. But in 2018 and beyond we are ready for more collaboration because we are more mature. We are speaking with several companies from our cohort about integrating and working together. So where is Farm Dog located today? Our R&D base is in Israel. Myself and product management are based in LA (across from the farmer’s market so we maintain consistent interaction with growers) and we have offices in Salinas and Texas. We continue to do a lot of traveling because of our work with Deere and because we have a lot of clients in the midwest and Canada. How many California customers do you have? We have customers in coastal growing areas, mostly strawberry, lettuce, and tomato. We are starting to work with specialty crop growers in the Central Valley. The more users we have in an area, the more powerful our platform is for all users. But a lone user in an area can still get a lot of value – on average 45 minutes time savings per day, improved communications in terms of recording data and sending out reports from the field. Are there any cooperative extension specialists in California who use your app? Yes, in state and across the country, a lot of extension agents want to use our app. We’re excited because widespread use will lead not only to a heat map across wide areas but the ability to communicate that information in real time. Recently, a California cooperative extension agent told me that they had purchased expensive dedicated hardware to collect field data and run the software. They then learned that Farm Dog could give them better data at a fraction of the cost. Unfortunately, they spent so much on the other system that they had no budget left for Farm Dog. It really drove home the real value Farm Dog can bring to an extension. I understand you have just made a big announcement related to Cooperative Extension. This is something we’re incredibly excited about and proud to have done. We see extension budgets going down all across the country. We know extension agents need new resources to be able to remain the trusted advisor to growers. We want the honest voice of extension to be the loudest, so we decided to give Farm Dog away for free to extension agents. We have partnered with the National Association of County Agricultural Agents, the professional organization for extension agents, to make this a reality. We also will build within the platform the capability for an extension to communicate directly with growers. And in addition, we will donate ten percent of revenues earned from grower license to extension. Farm Dog is an example of how tireless dedication to solving tough problems in agriculture led to invaluable relationships, including with a major corporate player. We look forward to seeing the evolution of Farm Dog for the extension community.